Where is the MGB VIN plate located? 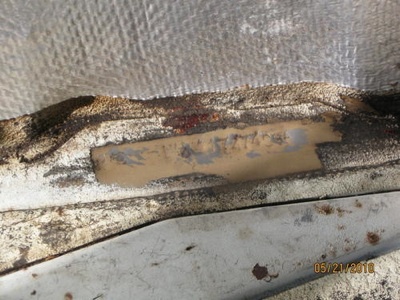 The VIN for the early MGB, approximately 1962-69, may be found stamped on a plate that is secured to the inner right hand fender (looking from the rear of the car), located just in front of the radiator. The VIN for the later MGB, approximately 1970 to 1980, may be found stamped on a plate secured to the left hand door post, and on a plate secured to the top of the dashboard. The VIN (Vehicle Identification Number) is also known as the Car Number or the Car ID. 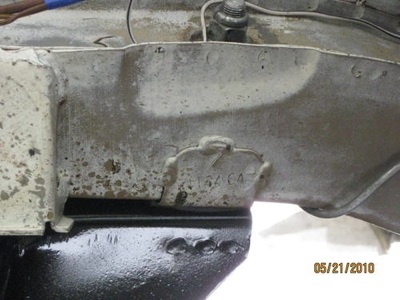 In addition to the stamped plates shown above, there are other places where the VIN is stamped: Starting with about car # 100, the VIN was stamped into the right front frame rail on cars for the North American market. This continued through the end of production. Then with the rubber bumper cars (1974½-1980), the number was stamped in the right side floor pan. Starting in late 1978, the number was also stamped on the right rear frame rail in the trunk. These numbers were stamped on the trim deck at Abingdon (after the car was painted of course). There are also many other numbers on the car, on plates that are riveted, welded or screwed on; these are not the VIN number. There are also numerous assembly numbers (particularly on late cars), these also have nothing to do with the VIN. This information is not applicable to VINs for Mark IV (1980) MGBs, which used a more modern VIN numbering scheme. Please note that the "model year" for a vehicle is usually different than the "production year" when it came off the assembly line, and in some places the date of first registration is used as the model year on the vehicle title, which can be different yet again. Bear with me, this is somewhat complex, and possibly incomplete. The information has been gathered from various sources to the best of our ability. How can I find my car's production date and original options? Contrary to logic and common sense, VIN numbers are not necessarily easy to translate directly into a precise "build date" when your MGB rolled off the assembly lines, as they are not necesarily sequential. At any rate, those records are not available to me. Some rough production dates are listed in the articles: MGB Specifications - Production Data and MGB Evolution and History in the MG Experience Library. Specific MGB model changes by VIN number can be found in the book Original MGB by Clausager - he was the offical Archivist of the factory production data at the British Motor Industry Heritage Center. That book is still in print and the information is copyrighted, so unfortunately it cannot be reproduced for free on this website. You can purchase a Heritage Certificate (aka BMIHT certificate) for your car, showing production data and original color and options, compiled from original factory records. These can be purchased at the Heritage Motor Centre UK website. Comments on "Decoding the MGB VIN"
The build date (month & year) should be on the same plate as the car number attached to the door sill. At least it is on mine. how would i determine the engine build date from the motor number? Thanks! Interesting and to the point. Wodering if you can help, my vin has only 4 numbers 4471, engine number 18ga4h7856 can you help with year was told it is 1964 model. list every day, but month range would be good. I found this site real useful. The VIN I have is short, so other search sites were unable to give me any information. I now the year of my car. I don't know anything about these "MGB" cars, but I see a very interesting future with this site and my new found car. What does 12H3505 mean on the lower front of the engine block? I was given the following vin number for a 1979 MGB, supposedly an LE. Can anyone tell me if this is an LE? also what year is this car?? GVVDJ2AG508181 How can I find out what the numbers represent?? Mine has number 11/70 aboveand GAN5 UB 95168-GI assumed a 1970, but according to VIN a 1971? I have a mgb, car no. is GHN4U/152016G and engine no. is 18GB-U-H 31588, Can any one tell me year of manufacture and any other details. All very nice, however my own B was sourced from America and in South Australia the government authority dealing with registration took the old engine number off due to the practise of stamping the number directly onto the block. This was seemed to be done by an illiterate monkey as the numbers wanders all over the available space and is S95685P. I did ask the authority to give me the original eng number, however living in a bankrupt state means that it would cost me over a $100 American to gain it. So, politely I have declined their offer of help! Hello,I should know what the letter "G" is for on my '77 MGB's VIN, but I can't recall. This "G" is the last digit in the VIN, following the six car numbers. Any help would be appreciated as this is an "itch" I've been unable to scratch. Wow, this is very useful hint! OK, so the VIN plate on my wife's (UK, rhd) BGT reads"GHD5 442733 G"So, first 4 characters tell me it's a BGT, Mark 3 but there's no "Market" or "Model Year" letter. And what does the trailing "G" mean then? Does it relate to "Model Year 1976"?Ta! I have read that the car ignition key code can be found through a search of the VIN. Another thought was that the key code was put on the Owner's Identicard. Anyone know about this? Malc P: Having no letter as the "Market" would indicate the car being for the UK market. Per the British Motor Museum, "From 1967 onwards a G suffix was added to the chassis number, for example: GHN5/-G"
I have an engine I bought that was not in a car, the serial number on the engine is 18V891AEL/00164. Anyone know the year of this engine ? What is the difference between GT and BASE? I can not locate a 17 digit vin number on my 1977 MGB. The door has GHN5UH411143G that's only 13. The number under the hood by the front grill is GU231 773396P and the engine number is 18V883AE-L778. Can anyone tell me how to get to 17 numbers so I can do a carfax? OK I have a1971 MGB roadster. No problem with VIN, the information given was great. BUT my engine number appears to be ER55864 . There are some digits above it 48G733 A couple other digits to the left AD Anybody with ideas ? James, Your engine is a Gold Seal engine. Your original engine died after assembly and somewhere in transit to the dealer. A 48G733 is a replacement for an 18V581/582/583 engine.Morrie,You can not get a 17 character VIN. At the time of manufacture, MG only used a 13 character VIN. Besides, the cars are too old and are not on carfax. I have a 67 B GHN3L103781 Anyone know approx. build date? Early, mid or late production? Trying to figure out. No fender solenoid. It is located don the engine, but not sure if it's the original engine. No # plate on the engine. Ira_E,You actually have a late 66 and not a 67. Up until 68, when the feds required a model year, the year was the first year when the MG was registered. My car, 99843 was first registered on May 27, 1967. It rolled off the assembly line on September 13, 14, 1966. Your car was built after that date, and before car 11418, which is the first car off the assembly line on January 1, 1967, per Clausager's book, "original MGB" on page 119. What's the difference between 66 and 67? Not much. In March of 67, back-up lights were made standard for Roadsters, April for GTs. Thanks,I think it might have a late engine and carbs. Car has documented 84K miles on it. It sat for 25+ years. My friend who bought it got it running, but I am replacing a lot of rubber bits and hoses. Plus just cleaning it up. Not having a fender mounter solenoid is the clue to a later engine.